From this website: Watarrka National Park in Australia’s Northern Territory covers 71,000 hectares and is home to Kings Canyon. 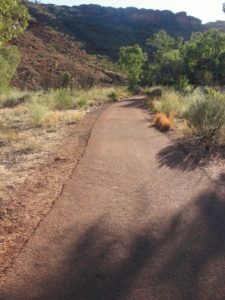 Located approximately 306km from Uluru, Kings Canyon is a approximately 3 ½ hours away from either Ayers Rock Resort and Alice Springs. 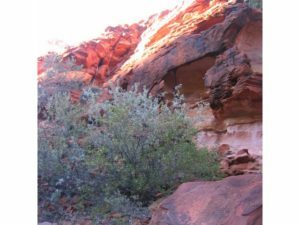 Kings Canyon is a fantastic example of Australia’s rugged outback landscape. The Canyon is an extraordinary chasm with sandstone walls plunging 270 metres down to a tropical oasis at the base and an eco-system that has all but vanished in other parts of the country. 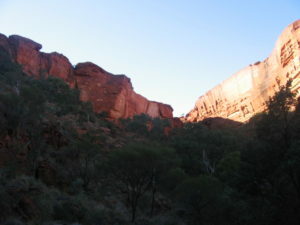 Kings Canyon’s soaring red sandstone walls can be explored from the air or by foot, with walking tracks for both adventurous hikers and leisure walkers. Trace the scenic rim of this ancient canyon on your own, or join a guided tour to learn about the evolution of this remarkable place. 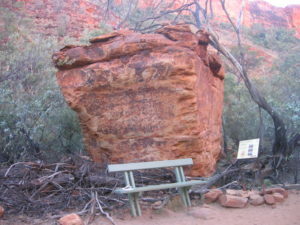 Kings Canyon offers a grand experience which cannot be replicated anywhere else. Follow the call of the untamed Never Never to a place you’ll never, ever forget. Between the ancient beauty of Alice Springs and iconic Uluru (Ayers Rock), discover the spellbinding scenery and jaw-dropping experience of the Australian outback at Kings Canyon. 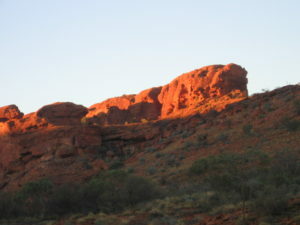 We are now offering return transfers from Uluru to Kings Canyon for the Ultimate Red Centre experience. 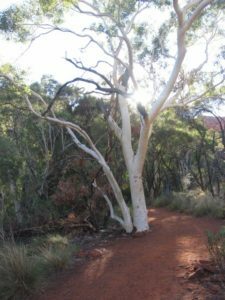 We will pick you up from Uluru, take you by coach to experience the culture of the Karkke indigenous community, have lunch, then go on a guided Kings Canyon Rim Walk. Stay the night at Kings Canyon Resort and travel back to Uluru the following morning in time for any connecting flights. Holiday in the heart of Watarrka National Park, where the unspoiled bush and red rock canyons of The Red Centre create an unforgettable outback adventure. Bring your sense of wonder, your family or friends, and discover a private audience with an ancient land, all on your own terms. Whether it’s a dawn rim hike in the quiet before sunrise, or an exhilarating helicopter tour of the Garden of Eden, you’ll find new perspective in Kings Canyon. The road that comes into the Kings Canyon carpark ….. 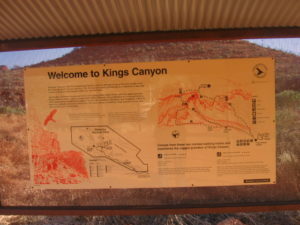 The big sign that says: Welcome to Kings Canyon. The sign shows the layout of walks …. 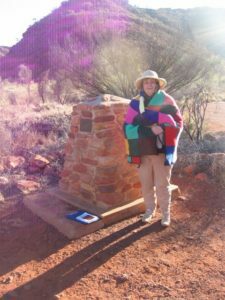 Harriet and Ken Aitken decided to go on a different walk along the creek in the Kings Canyon valley. 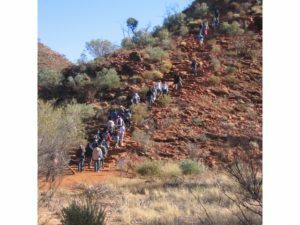 Everyone else opted to walk up one steep slope ( see the photo below) which took them for several kilometres along the rim of the Kings Canyon valley. 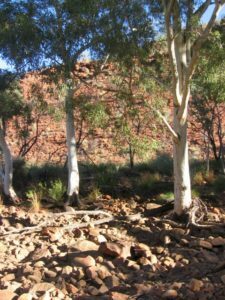 See the photos below of what we saw along the the creek in the Kings Canyon valley. 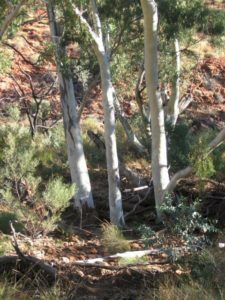 From this website: This ancient sandstone canyon that soars above dense palm forests is another icon of Australia’s Red Centre. 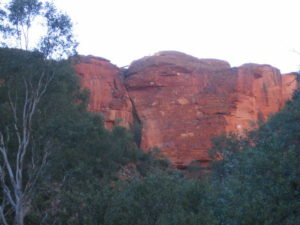 Climb to the top of the rim of Kings Canyon at sunrise or sunset. 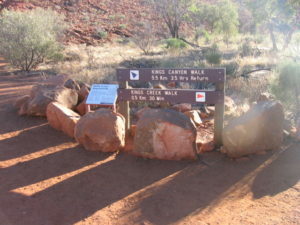 The challenging six kilometer Kings Canyon Rim Walk takes around 3-4 hours. There are spectacular views of the gorge below and of the surrounding landscape. 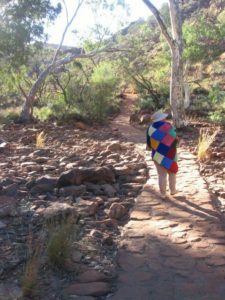 Take a guided rim walk with an Aboriginal elder and learn about the significance of the area to its traditional owners. Descend to the canyon to the Garden of Eden, a permanent waterhole surrounded by lush plant life. Explore the unusual weathered rock formations known as The Lost City. 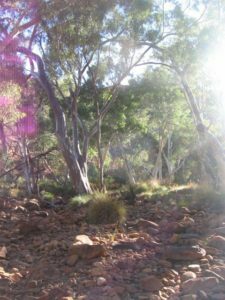 For the less energetic, the shorter and easier Kings Creek Walk at the Canyon base leads you through lush ferns and eucalypts to a platform with views of the sheer canyon walls above. 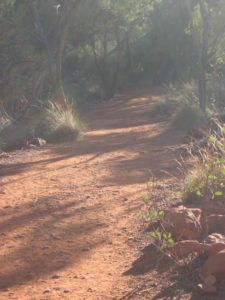 The 22-kilometre Giles Track that connects Kings Canyon to Kathleen Springs is popular with more adventurous hikers. You could also explore the landscape from the back of a camel on a camel safari or tour Kings Creek Station, a real working outback cattle station, by four-wheel quad bike. To appreciate the true beauty and grandeur of Kings Canyon see it from above on a scenic helicopter flight. 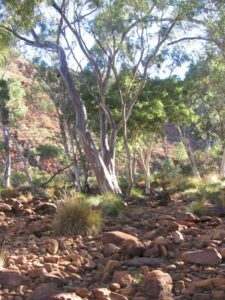 See this website: Kings Canyon for a wonderful helicopter view of Kings Canyon ….. This is the creek region with many small boulders exposed by the flood waters …. 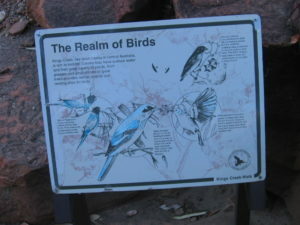 The path passes high above the creek zone as a natural red earth path …..
A sign along the way which informs you on the Realm of the Birds …. 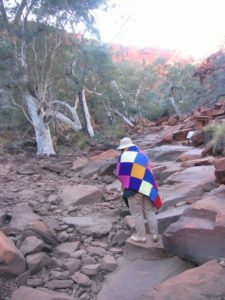 When the natural red earth path finishes after about a kilometre along the creek, Harriet had to pick her way over large flat stones that have fallen off the flat layers of the sandstone cliffs above …. 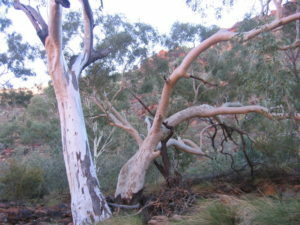 see the photos below …..
Two eucalypt trees growing in the higher and drier zone above the creek …. 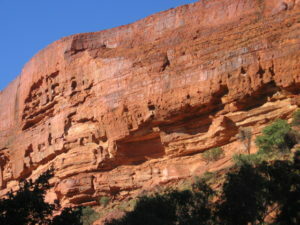 The flat layers of the sandstone cliffs above the creek ….. there is great beauty in them as the sunlight moves to reveal hidden small caves and ridges in the weathered cliff face ….. this is in bright orange or darker orange caused by shadows or the presence of dark minerals in the flat layers of the sandstone cliffs ….. The flat layers of the sandstone cliffs are being really accentuated by weathering of the soft layers leaving the harder layers standing out …..
A huge cuboidal block of sandstone that has fallen off the sandstone cliffs …. provides a convenient back rest to the small timber seat …. 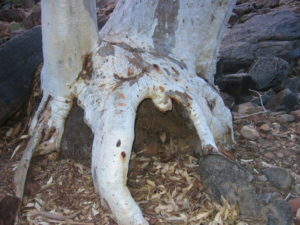 The root bowl of this eucalypt tree, has a very organic feel as it struggles to survive in this dry region …. 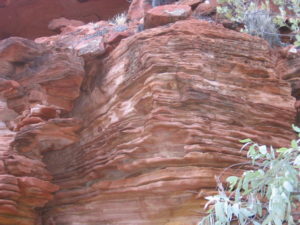 The soaring sandstone walls of Kings Canyon were formed when small cracks eroded over many of years. 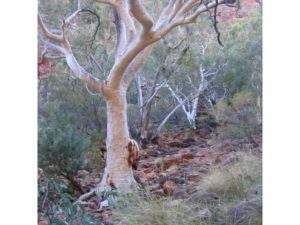 Derived from an Aboriginal word referring to the umbrella bush that thrives here, the Luritja Aboriginal people have called the Watarrka National Park area home for many years. 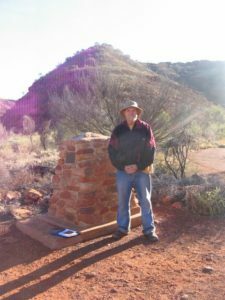 The end of the posts of 2006: NORTHERN TERRITORY TRIP …. 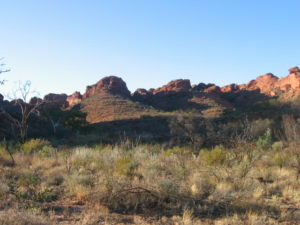 In Central Australia.